Rapid detection of chemical leaks is crucial in industrial settings. Accidental release of Toxic Industrial Chemicals (TICs) and Volatile Organic Chemicals (VOCs) can place worker safety, local populations, and the surrounding environment at risk. Chemical leaks can impact the operation of chemical processes by changing process parameters — or cause fires and explosions that shut down entire production lines. Occupational safety and environmental regulations make it essential for factories, refineries, and other production facilities to quickly detect and identify hazardous chemicals. Block Engineering's LaserWarn was designed to protect industrial facilities and surrounding environments from toxic chemicals. 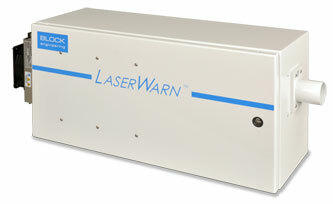 The LaserWarn is an open-path detection system based on infrared Quantum Cascade Laser (QCL) technology. The system scans 24/7 for target chemicals, covering perimeters as large as 500 meters in a standard configuration. The eye-safe lasers in the LaserWarn system allow for mounting in areas where workers or other people will be present. The system continually scans for gases that cross the laser beam path, and within seconds, triggers alarms when concentration thresholds of target chemicals are detected. TICs/TIMs, VOCs, and other industrial chemicals can be detected in parts-per-billion (ppb) ranges from hundreds of meters away. When the LaserWarn is used for perimeter or fence-line monitoring, the system is set up to create a path around the outside of a facility. Using a series of low-cost reflectors and mirrors, the Quantum Cascade Laser creates an invisible detection boundary. Any fugitive emission or other target gas that crosses the path triggers alarms. The system can be programmed to ignore normal background atmospheric chemistries and pollutants, in order to avoid false alarms. Used to pinpoint sources of leaks, the LaserWarn can either be fixed-mounted, mounted on a x-y-z scanner, or carried to the site of a potential leak. The QCL-based spectrometers detect chemical signatures of released gases, and compare them to a built-in software library. Target gases can be detected in sub-second times. When chemicals are released in or around industrial facilities, security personnel can bring the LaserWarn directly to the site of a gas cloud. At a weight of approximately 10 pounds (5 kilograms), the portable system can be hand-held or mounted on a standard tripod. Reflectors are introduced from a safe distance, and specific chemicals are detected. The LaserWarn is programmed to detect a wide variety of industrial chemicals, including benzene, toluene, ammonia, bromine, hydrochloric acid, and industrial solvents. 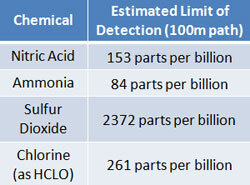 Detection limits are generally in the parts-per-billion range. Compared to traditional infrared and FTIR technology, Block's Quantum Cascade Laser-based system offers significant improvements in response time, pointing accuracy, detection distance, and chemical sensitivity.